A whole new dimension in fire pits for your outdoor living space. Gas-burning fire pits are awesome Phoenix backyard attractions. Instant flames, no irritating smoke, soot, or ashes… ambience on demand. But no matter how unique or beautiful the stonework or vessel, the burning pit fill is well, boring. Lava rock. You can have any color you want, as long as it’s red or black. At least until recently. Now, you’ve got so many options, choosing just one could be difficult. 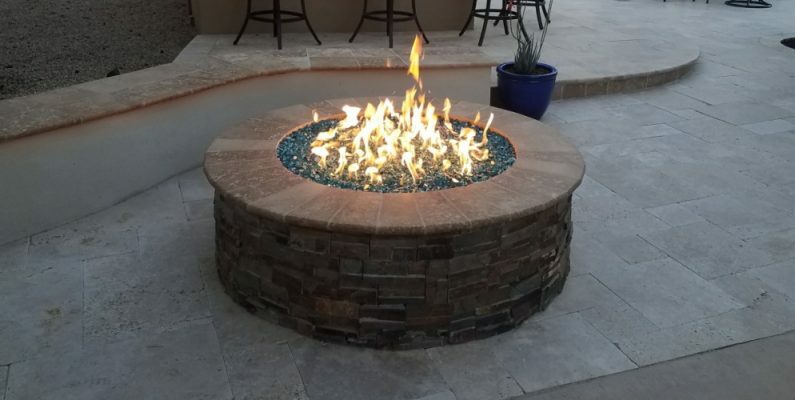 Say hello to fire glass, the latest in Phoenix fire pit design. You not only have more than one size to pick from, but different colors and surfacing too. It’s hot, sleek, and gorgeous – you’ll wonder what the attraction of lava rock was all about. Well, perhaps not, since it was the only material that wasn’t destroyed by direct flame contact and intense heat. All past tense. Fire glass is a special glass formulated to withstand extremely high temperatures and flames. It comes in both fine and chunky textures, depending on size. You’ve got a choice of 9-12 colors, depending on the style selected. Then there’s the finish. It can be somewhat jagged and irregular like sea glass, or smoother glass pebbles, and very rounded like floral vase gems. Surfacing ranges from plain glass sheen to reflective and somewhat opalescent. The original Fire Glass is also recycled glass, and has an appearance like chunky broken glass. It’s a bit different texture than the Classic and Premium collections due to containing a mix of piece sizes. This results in denser fill than using all one size pieces. You have 12 colors and 2 size options to pick from within the standard Fire Glass category: small with a 1/4-1/2″ mix, and medium with a 1/2-1″ mix. The Classic Fire Glass Collection is divided into 1/4 and 1/2 inch categories. The size relates to the glass thickness, with variable piece width. It looks a lot like chunky crushed ice, the thicker the glass, the chunkier the fill. You have 9 color choices in the 1/4″, and 12 in the 1/2″ group. While they are all lovely, Premium Fire Glass is exceptional and classy. Also called Reflective Fire Glass, it’s highly polished on all sides, which results in an overall smoother surface. Here too, the group is divided into size categories of 1/4 and 1/2 inch, with 10 and 11 color options respectively. Eco Glass Beads are made from recycled glass. They look a lot like floral glass pebbles, and come in 11 vibrant and neutral colors. Though they don’t look like natural stone, they have that kind of texture due to non-uniform sizing. Fire Beads greatly differ from the Eco Glass group. These are perfectly round with a domed top and flat bottom, like glass drops. There are 9 colors to pick from, some of which are available in a Luster finish that reflects light without great color loss. The standard finish Fire Beads have wonderful jewel tone depth. Zircon Fire Glass is shaped like uncut precious stones – irregular with soft edges and somewhat rounded angles. A choice of 9 gorgeous gem colors, with 2 selections in this group having a luster or iridescent surfacing finish. Perhaps the most stunning here is Rain Drop, flashing hints of rainbow hues, and looking like a pile of diamonds with or without flames.